In December 2012 we were wondering what to do about Christmas cards as the cost of postage in the UK had recently increased by an enormous amount. We had the bright idea of sending a musical Christmas greeting, instead of a physical card, to everyone on our database so spent the evening of December 13th in the studio recording an extremely light-hearted version of Ding Dong Merrily on High. The following day we emailed a hyperlink to everyone we knew, and by December 26th, when we removed the track from the website, it had been downloaded over 6000 times. We received lots of comments along the lines of "When's the rest of the album coming out?" Well, this is it, and we hope you enjoy it! The original tune (the main theme here) was collected by Cecil Sharp from a Mrs Mary Clayton of Chipping Campden, Gloucestershire, and published by him in 1911. It has a wonderfully joyful feel, but is very short, so Chris wrote the second part to make it into a longer celebratory piece. The English traditional carol I Saw Three Ships Come Sailing In provides the melody for the first part of this piece. It has a great tune but is very short, so we pressed the second half of The Sussex Carol (having changed it a bit!) into service as a second part. Ralph Vaughan Williams collected The Sussex Carol in 1904 from a Mrs. Verall of Monk’s Gate, near Horsham, Sussex. However, the words were written by Luke Wadding (1628-1692), Catholic Bishop of Ferns, Co. Wexford, and appear under the title Another short caroll for Christmas Day in his Smale Garland of Pious and Godly Songs, published in Ghent in 1684. This tune - found in Playford’s The English Dancing Master (1651) under the titleChestnut (or Doves Figary) - appears to have become associated with the words commonly sung to it today only in the nineteenth century, which would explain why it seems a bit at odds with them in mood. Its dark undertow inspired our slightly ‘gothic’ approach to the arrangement. This is a really appealing traditional Andalusian carol, which we heard it on a December trip to Spain a few years ago. A c. 1740 manuscript compiled by John Francis Wade (1711 – 1786), an English Catholic scribe and teacher of plainchant associated with the English College in Douai, is the earliest source for the Latin hymn Adeste Fideles. The words were probably written by Wade, but the tune is likely to be older. There is a tradition that the hymn was sung for the first time in the Dominican Priory in Channel Row, Dublin, soon after the Jacobite rising of 1745. It was translated into English in the nineteenth century, and as Come All Ye Faithful became one of England’s most popular carols. However, the original Latin hymn is by the far the most widely-sung version in Ireland. It is usually belted out at high volume, so Chris thought he’d like to give it a more reflective, out-of-tempo treatment. The tune known today is an adaptation and elaboration by William Chappell (in hisPopular Music of the Olden Time 1853-1859) of the call of the London waits published in John Playford’s English Dancing Master (1665). In the medieval period, the London waits patrolled the town every night, kept watch and sounded the hours. By the seventeenth century the waits were no longer watchmen, but at Christmas they still processed at night-time in the old way, while singing carols. This traditional English tune (a version of The Ploughman’s Dream) was collected by Ralph Vaughan Williams in 1903 from a man named Garman who lived in Forest Green, near Ockley in Surrrey. The words of the carol (which became associated with this tune only at a much later date, and only in Britain and Ireland) were written by Phillips Brooks, rector of Holy Trinity Church, Philadelphia, in 1865. What has come to be known as the Coventry Carol dates from the 16th century at the latest and is one of two surviving songs from the mediaeval Pageant of the Shearmen and Taylors (first mentioned in 1392), part of the cycle of mystery plays annually performed in Coventry on the feast of Corpus Christi. Máire starts the track with a setting based on that to be found in a 19th century copy of the original 1591 manuscript (which had been destroyed in a fire in 1879). The modern interpretation by Chris that follows retains the plaintive feel of this beautiful tune. An American carol. The tune was composed by William J. Kirkpatrick and first published in Cincinnati in 1895. A lovely French carol probably dating from the eighteenth century. It was the first French song Máire ever learnt, when she was twelve years old. Another American carol, composed by John Henry Hopkins (1820-1891), rector of Christ’s Church, Williamsport, Pennsylvania, and published in his Carols, Hymns and Songs, 1865. The words to this famous hymn were written by Mrs. Cecil Frances Alexander, born in Dublin in 1818. The tune appears to have been composed by Henry John Gauntlett (1805-1876). 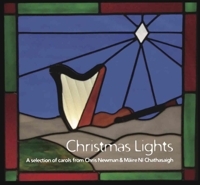 A very popular Irish Christmas carol, first published in 1955 in Volume 2 of An Chóisir Cheoil and probably composed by its compiler, Seán Óg Ó Tuama. Seán Óg does not indicate its provenance. However, his late sister-in-law Róisín Ní Shé informed Máire that he was definitely responsible for its composition, together with that of Deus Meus (often erroneously thought to be medieval) and a number of other songs to be found in the series. A traditional Cornish carol, collected by the Revd. G. H. Doble in St. Day, near Redruth, Cornwall, in the early twentieth century. The Orchésographie of Thoinot Arbeau or Jehan Tabourot is the source for this wonderful sixteenth-century French dance tune. G. R. Woodward (1848-1934) decided that it would make a good basis for a carol and accordingly provided it with the faux-‘Olde-Englishe’ text sung to it today. Many thanks to Nollaig, Maggie and Roy; Libby Stuart; Kevin Martin; Maeve Gebruers and Nicholas Carolan of the Irish Traditional Music Archive; and of course our families and friends for putting up with our abstraction during the development and recording of this project!